This is overdue, but who cares? Cake is cake. I demand inspiration each year for this cake. You may remember last year’s version, or the one before. And lest we forget, the first year I handed him the challenge, his reply was for a cake that “most people wouldn’t want to even try, based solely on the description”. This year, the request was for something anise. Or pineapple. Whichever. Of course, I had to do both. What’s life about without a good challenge now and again? 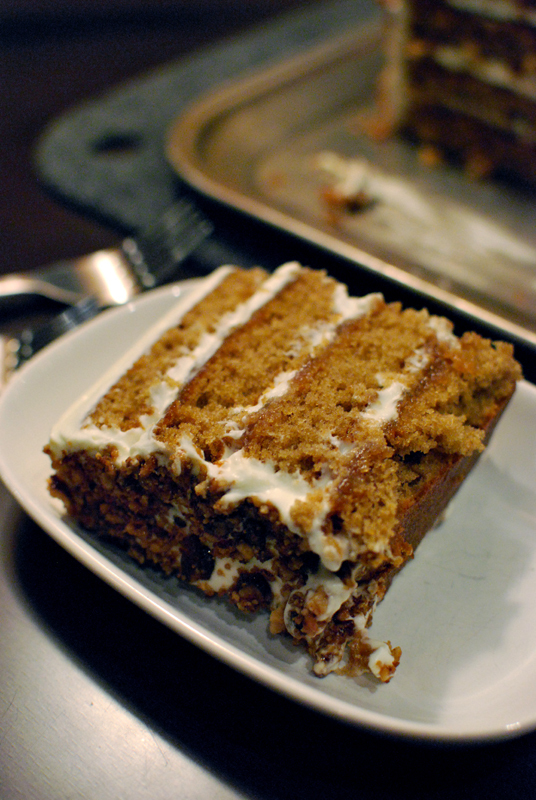 In the end, I gave him an Anise Spice Cake with Pineapple Jam, Crème Fraîche Frosting, and Maple Coated Walnuts. And if I’m brutally honest (I am), I wish I had been more bold with the anise, and used a heavier hand with the pineapple. 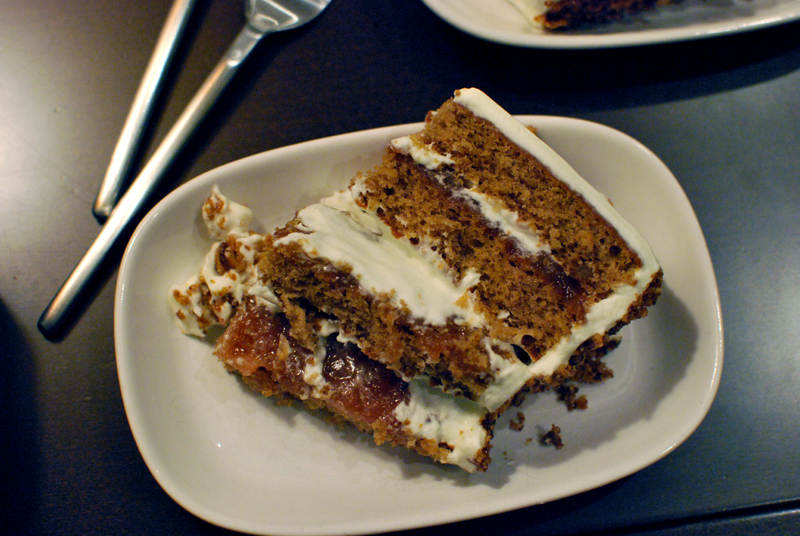 Neither flavor came through particularly strong, though the cake was a very good one overall. It’s not too rich. The crème fraîche puts the frosting firmly on the tangy side of sweet, without being too sour. 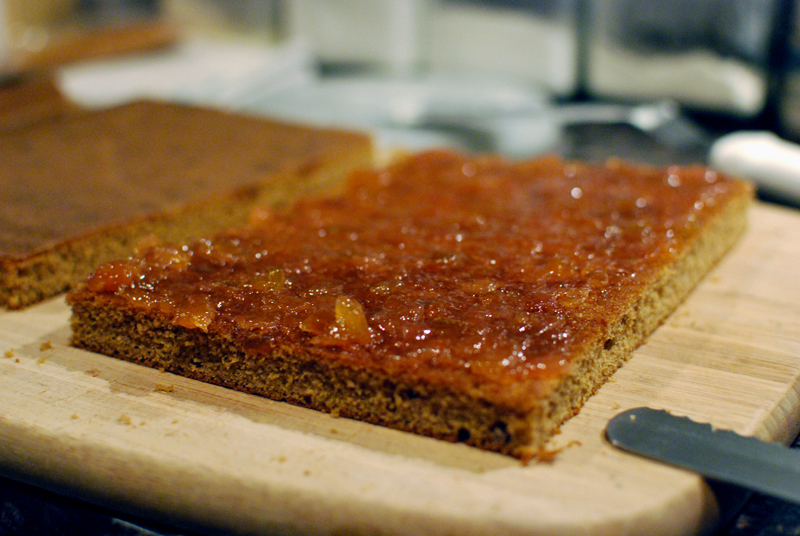 The cake is very moist, and the pineapple jam helps it stay that way over time. The crunch from the maple walnuts is just delightful. Also, be sure to let the cake chill thoroughly before slicing it. Take it from one who knows. The jam is adapted from this recipe. 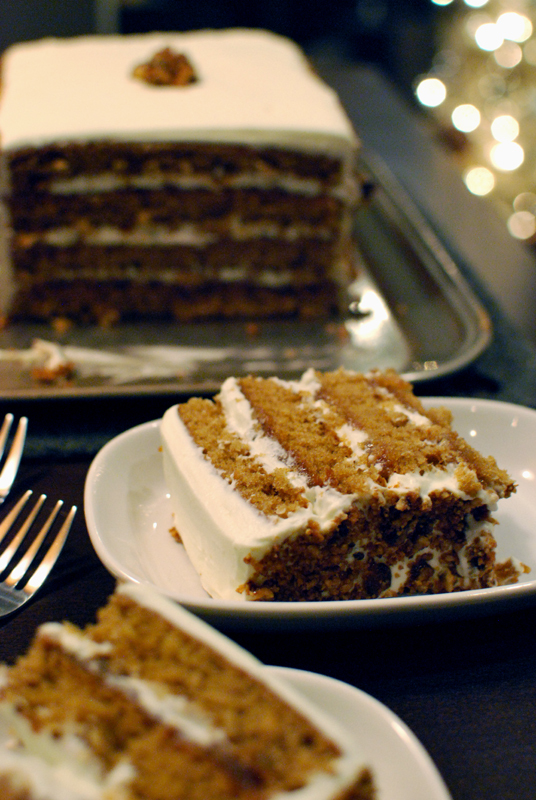 The cake and frosting are adapted from this recipe. 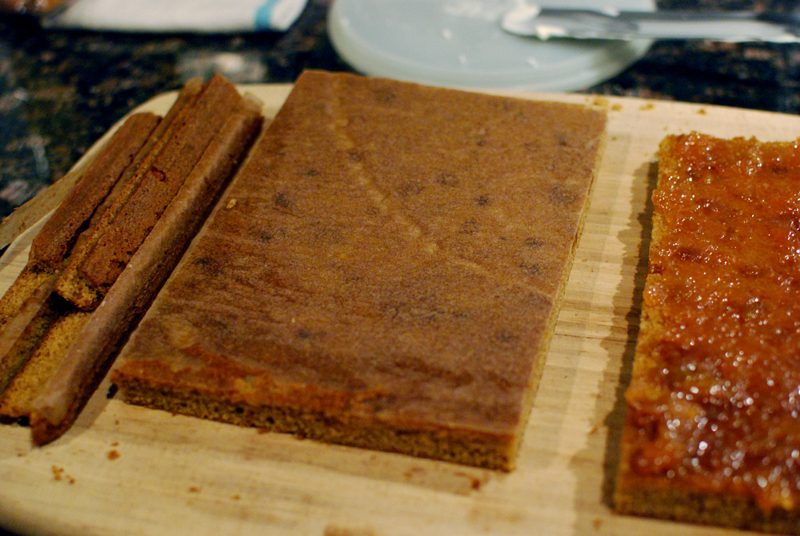 I baked this in a half sheet pan, though round cake pans will work just as well. They will bake more quickly, though. Measurements are given in grams, because I take great pleasure in precision baking. I honestly don't understand how anyone bakes without using a scale. The frosting, on the other hand, can handle a lot of variance, so the measurements are a little looser. Wing that one. Have fun. 1. Chop the pineapple and pear, and combine in a medium pan with the sugar and lemon juice. 2. Simmer over medium-low heat until fruit is tender, about 10 minutes. 3. Reduce heat to low. Stirring occasionally, simmer an additional 30 to 60 minutes, or until thick. Do not let scorch. Jam will continue to thicken as it cools. Can be made several days in advance. 2. Toast walnuts on a sheet pan for 7 to 10 minutes, or until fragrant but not overly browned. Let cool. Lay out a piece of aluminum foil on a heat-proof surface. 3. Place nuts in a nonstick skillet over medium-high heat. Drizzle maple syrup over walnuts, and stir to coat. Bring to a boil, stirring constantly. Cook until syrup is thick and dark, about 3 minutes. 4. Turn nuts out onto the foil, and sprinkle with a large pinch of Kosher salt. Let cool at least 1 hour. 5. Chop coated nuts finely, either by hand or by pulsing in a food processor. Can be made several days in advance. 1. Preheat the oven to 350° F. Lightly coat a rimmed baking sheet (13x18x1 inch) with cool or room-temperature butter, then dust with flour. Knock any excess flour out of the pan. Line the bottom of the pan with parchment paper. 2. Whisk together the flour, spices, baking soda, salt, and ginger. Set aside. 3. Combine the butter and brown sugar in the bowl of a stand mixer. Using the paddle attachment, cream together on medium speed until fluffy, 3 to 5 minutes, scraping the bowl once or twice to combine thoroughly. 4. Add the eggs one at a time, beating on low to combine after each addition, scraping the bowl as needed. 5. Stir the hot water and maple syrup together. Add the dry ingredients to the butter-sugar mixture in the stand mixer in 4 separate additions, alternating with 3 separate additions of the maple syrup and water. Beat on low speed to combine after each addition, scraping the bowl as needed to incorporate evenly. Do not overmix; just beat until no large pockets of flour are left. 6. Pour the batter into the prepared pan, and smooth the top evenly. Bake at 350° F for 30 to 40 minutes, or until done. Let cake cool in pan. 1. Sprinkle the gelatine evenly over the surface of the cold water in a small, microwave-safe bowl. Let stand 5 to 10 minutes, or until evenly moistened and bloomed. This step, though optional, will help maintain the integrity of your frosting and keep it from weeping over time. 2. Microwave the bowl of gelatine for about 30 seconds, or until dissolved. 3. Combine the crème fraîche and cream in the bowl of a stand mixer. Using the whisk attachment, whip on medium-high while gradually adding the powdered sugar. Do not beat past soft peaks. 4. Drizzle in the gelatine, maple syrup, and rum while whisking at low speed. You may need to whisk or fold these in by hand. 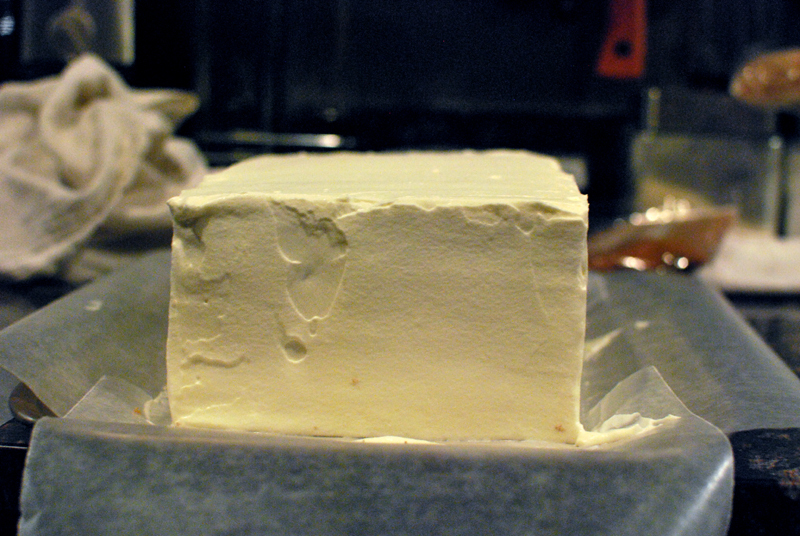 If the cream starts to look a little lumpy and over-whipped, whisk in some additional heavy cream to smooth it out. 1. 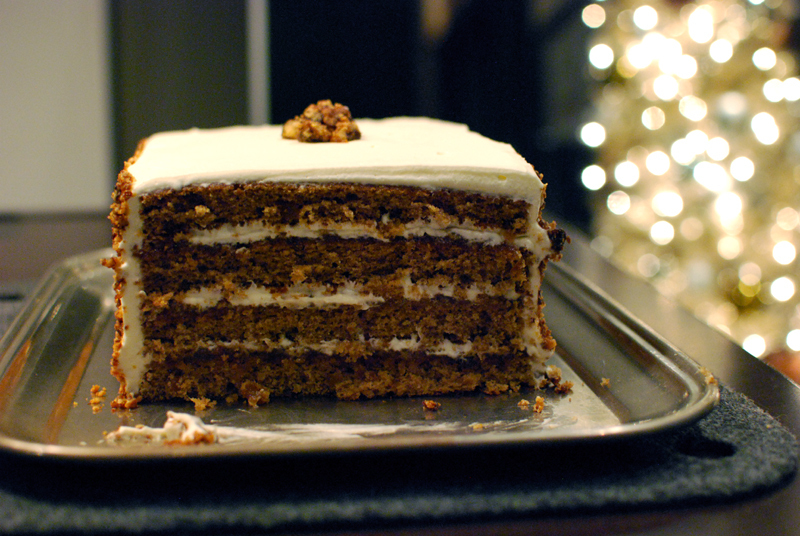 Using a serrated knife, cut the edges of the cake off (just like cutting the crust off a sandwich). Cut the cake into four equal-sized pieces. 2. 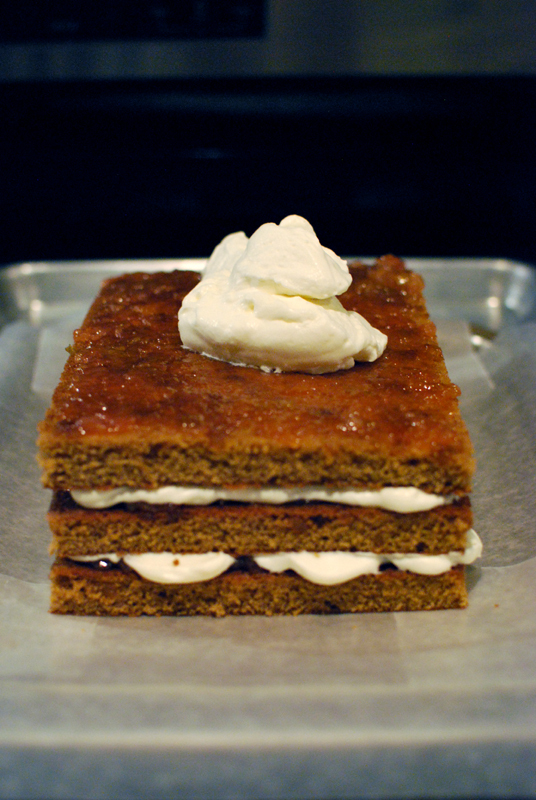 Spread one piece with a thin layer of the Pineapple Jam, and place on desired cake plate or serving platter. Slide four strips of wax paper under each side of the cake to protect the platter from over-frosting. 3. Spread a dollop of frosting evenly over the top of the Pineapple Jam layer. 4. Repeat the layering process, spreading a cake layer with jam before stacking it onto the cake and spreading frosting over the top of the jam. Do not spread jam onto the last cake layer; just stack it on top of the other layers. 5. Place a very large dollop of frosting on the top of the cake. 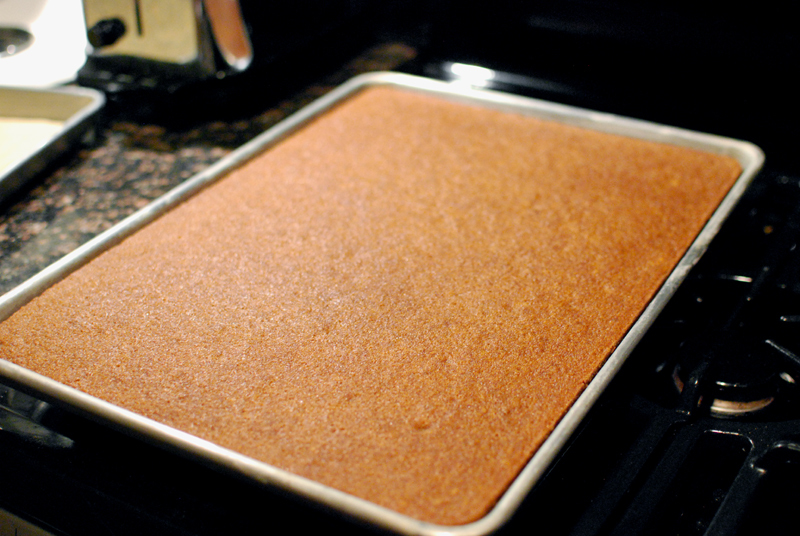 Smooth it across the top and down the sides of the cake in a thin, even layer. Do not worry about crumbs at this point, just make it look even. This is called a "crumb coat". Use additional frosting as needed, but make this coat a thin one. 6. 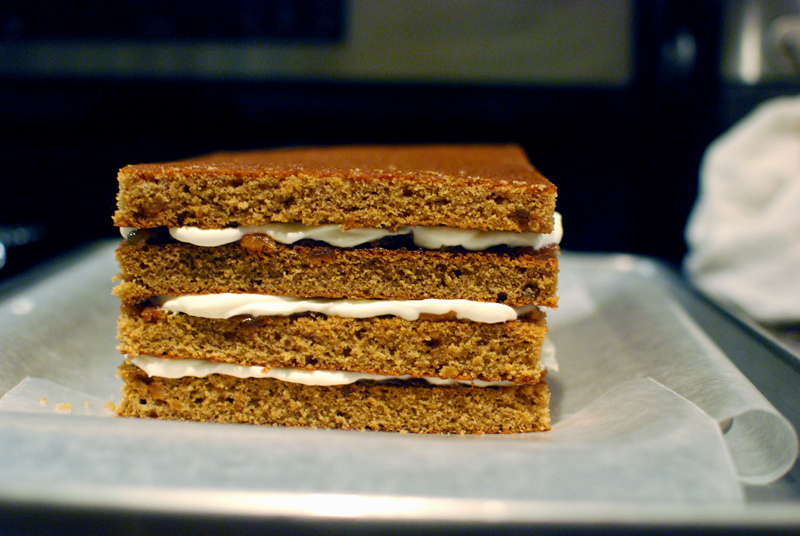 Once the crumb coat is finished, chill the cake and any unused frosting for at least 1 hour. 7. 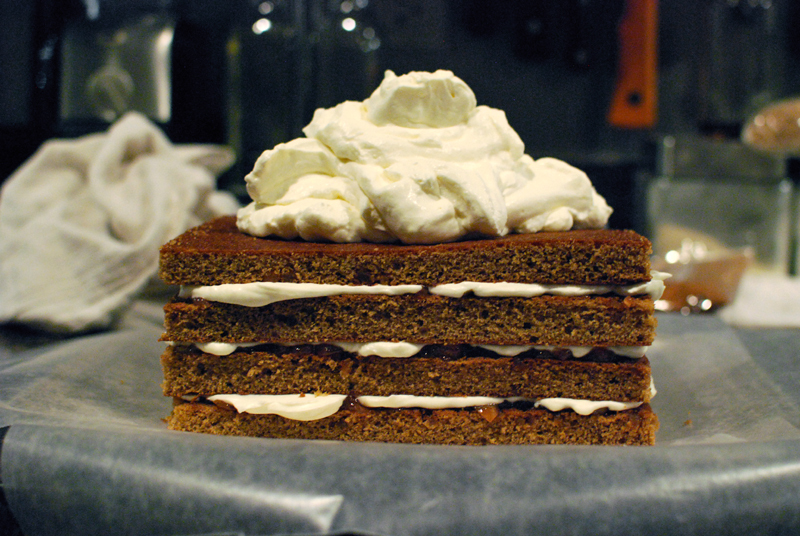 When the crumb coat is firm and well chilled, repeat the frosting procedure with the remaining frosting. No crumbs should be showing. 8. 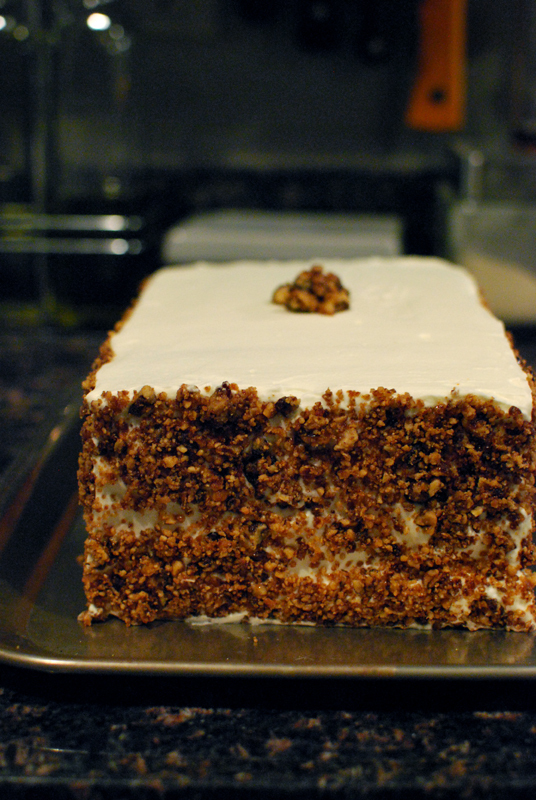 Press the chopped Maple Coated Walnuts into the sides of the cake. 9. Chill the cake at least 1 hour, or until frosting is firm and well chilled. Now remove the wax paper from under the cake. 10. Serve with candles and merriment and friends to sing "Happy Birthday". A spot of Champagne or Bourbon is not unwelcome here. second coat of frosting. this cake would fail in culinary school, please don’t show this to my former teachers. finished! masking the sides with nuts fixes all ills.